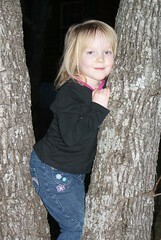 Grace came home one night last week wanting to climb a tree. We have a lot of trees but most of them are hickory trees and not too condusive to climbing but she wasn’t to be detered. I told her she was going to have to make it all work because I needed to cook dinner. So out she went. Then back she came. She needed a rope. We dug her jump rope out of her toy box and back out she went. She finally managed to wedge herself up into the crotch of two hickory trees and knot her rope around the little scraggly branches that were squirting out about head high. The next night Bryon went out with her and came and knocked on the window to show me she was halfway up a cedar tree. I’m pretty sure my eyes would have just swollen shut and there I’d have to stay, but she was like a spider monkey and one happy girl. She wants a tire swing but we just don’t have any hospitable limbs. She may have to talk her Daddy into a treehouse instead.